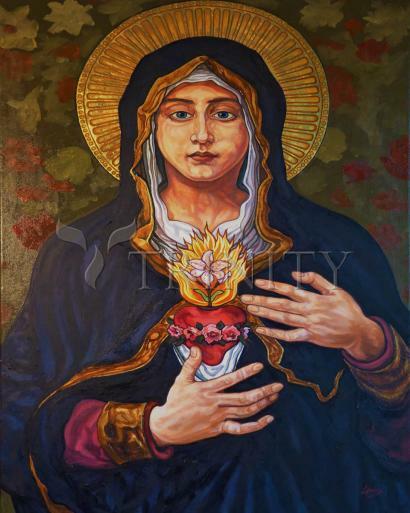 In this image of Mary, she is pictured with her Immaculate Heart aflame at the moment of the Annunciation when she learned that she would carry the Christ child, equally Lord and man, into our world for its salvation. This supreme moment changed all moments. Below is a prayer from St. Teresa of Calcutta that asks for the blessing of the gift of Mary’s Immaculate Heart. May her heart serve as a model of how our hearts should love our Lord. O Immaculate Heart of Mary, Heavenly beauty and splendor of the Father, You are the most valued Heavenly treasure. New Eve, immaculate in soul, spirit and body, created of the godly seed by the Spirit of God, You are the spiritual Mother of mankind. Pure Virgin, full of grace then and now, Your whole being was raised Heavenly in full glory, To be elevated above all the hosts within the Kingdom of God. O Heavenly Mother, Queen of Heaven and earth, I recognize the glory of your highest title, The Immaculate Heart of Mary! Loving Mother, dispenser of endless blessings, You who continuously intercedes on our behalf, Please present my need before your loving Son Jesus. (Make your special request here). O Immaculate Heart of Mary, I know that you are now presenting my need before Jesus, for you have never turned away those in dire need. Mother dearest, I await your favorable answer, submitting myself to the Divine will of the Lord, for all glories are His forever and ever. Amen.